WHY DOES MUSICIAN NEED SOCIAL MEDIA There was a time when an artist had to completely depend on Music label to release his creative work but thanks to SOCIAL MEDIA, now an independent artist can Market his/her work Globally to advance their career. Such an incredible powerful tool we have today at our disposal At the same time, there is overwhelming amount of music (from average to excellent quality) getting released every day which is certainly making difficult for talented artists to stand out significantly. 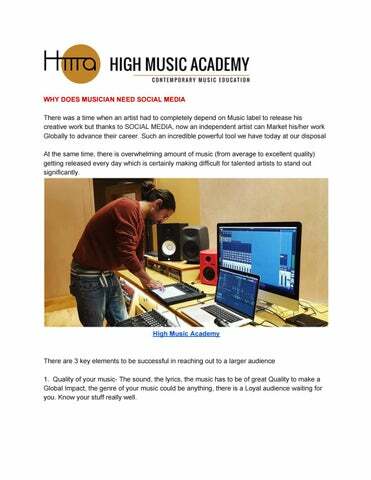 â&#x20AC;&#x2039;High Music Academy There are 3 key elements to be successful in reaching out to a larger audience 1. Quality of your music- The sound, the lyrics, the music has to be of great Quality to make a Global Impact, the genre of your music could be anything, there is a Loyal audience waiting for you. Know your stuff really well. 2. Your USP as an artist- Define one thing that sets you apart as a Musician and be yourself as Genuineness appeals to everyone. It could be your voice, choice of instruments, treatment of a song or styling n presentation or else you will be lost in the crowd. 3. Regular interaction with your fans through text, images, audio, video. In the blink of an eye you could be talking to a producer in America or live stream your studio sessions to reach like minded musicians If you have great substance to share then making best use of Social Media is a powerful key to your way upwards. 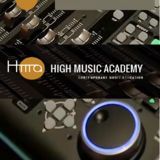 If you are looking for a best Music academy in Delhi , Then Visit to High Music Academy for Professional Music Courses.